While addressing the people on the occasion of Maa Baglamukhi Mela at Bharari in Seraj Assembly constituency of Mandi District today, Chief Minister Jai Ram Thakur said that fairs and festivals were integrated part of our rich cultural heritage which should be preserved at any cost. These fairs and festivals not only provide wholesome entertainment to the locals but also help in promoting our culture and traditions. He said that Bharari Mela was one of the traditional fairs of the area which was celebrated with great fervour and gaiety.The Chief Minister said that the State Government was committed to develop unexplored and virgin areas of the state from tourism point of view. The basic infrastructure facilities would be provided at Janjehli, Shikari Mata temple and Gadagusain for attracting tourists to these areas. This would not only ease out the flow of tourists in already overcrowded major tourist destinations of the State but would also provide employment and self-employment opportunities to the local youth nearer to their homes. He said that Rs. 25 crore tourism project has been sanctioned for Janjehli area by the State Government. 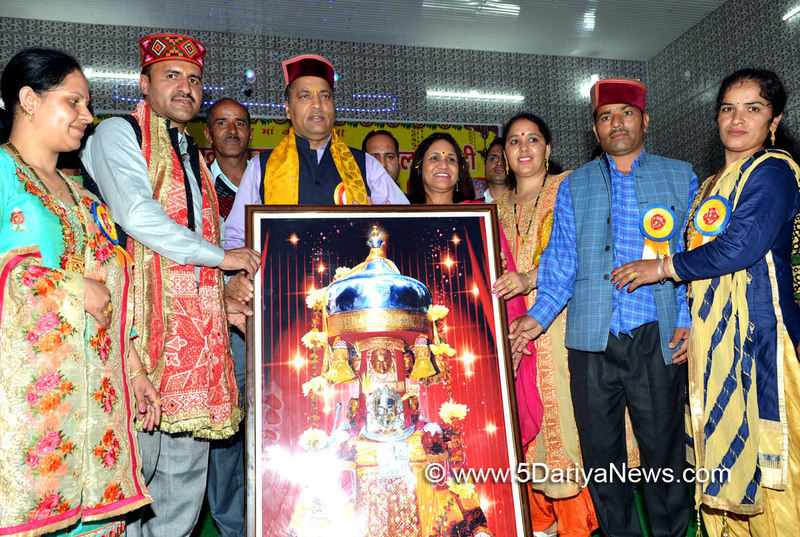 Jai Ram Thakur said that the people of the State and the blessings of the local deities was his greatest strength and it was due to these blessings that today Seraj was witnessing speedy development. He said that with the love and benevolence of the people, he was committed to make Himachal Pradesh topmost state of the country in matter of development and making it self-reliant State. He said that the State Government has succeeded to get assistance of Rs. 5510 crore as Central assistance which was a record in itself as no State Government succeeded to get financial assistance in such a short time period. He announced opening of Health Sub Centre at Surah and Rs. 10 lakh for strengthening of local road. He also announced that a Community centre would be constructed at Mela Ground Baglamukhi temple complex for which he sanctioned Rs. 25 lakh. He announced Rs 11000 each for 11 Mahila Mandals of the area.Earlier, the Chief Minister along-with his wife Dr. Sadhna Thakur performed Puja at the local Maa Baglamukhi Temple.Several social, cultural and political organisations honoured the Chief Minister on the occasion.President of the local Gram Panchayat Tajinder Thakur detailed various developmental demands of the Panchayat. He thanked the Chief Minister for announcing Rs. 25 lakh for construction of community hall at the Mela site.A colourful cultural programme was also held on the occasion. Hundreds of people in their traditional attire participated in the four day long fair.Deputy Commissioner Rugved Thakur, SP Gurdev Chand Sharma Chief Engineers PWD and Electricity Board were present on the occasion among others.